HELLO WORLD!!! It’s me, Azula! I am one action packed, fun-loving, toy-tugging, treat-chomping snuggle buddy looking for some direction in life. 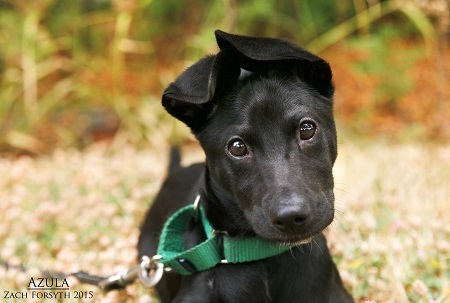 I am a 3 month old Lab/Border Collie mix with so many talents, so many skills, I could be anything! An astronaut maybe? Or a poet laureate? Perhaps a racecar driver? zoom! I need the right home that can focus my energy in a positive way to help me be the BEST DOG EVER!!! Puppy classes are definitely a must (even raw talent needs refining). I am off to a tremendous start with my socialization so I would flourish in any home with cats, kids, dogs, you name it. As long as I get a lot of one-on-one training and attention we will work out great. Are you just the home for me? Fill out the adoption application so we can schedule a meet. I am fixed, vaccinated and microchipped. My adoption fee is $350.